Left to Right- Carmen Del Guercio (President & CEO of MD Food Bank), Nancy Smith (Senior Director Government Relations and Principal Gifts) and Rob Sobhani (Founder and CEO of Sparo). 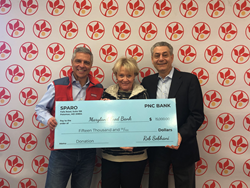 Sparo Corporation, a developer for the Sparo Community Giving Platform, an early stage technology platform to make charitable giving fun and easy, announced today that it has delivered a $15,000 donation to the Maryland Food Bank to provide 45,000 meals for area families. Sparo’s patented platform allows users to find and make donations to charities, and offers charities a chance to win a jackpot donation through its Sparo Sweepstakes. Baltimore-based Maryland Food Bank has faced increased pressure recently helping families impacted by the government shutdown. Sparo aims to make it easy for donors to discover new charities that need their help and will conduct frequent sweepstakes whereby a participating charity is randomly selected to win the jackpot. Frequent donors win gift cards and other prizes. The SparoPrize platform runs online and is currently being beta-tested by the Maryland Food Bank, along with the Omid Foundation and Save a Child’s Heart. Sparo partners with Network for Good to distribute funds. For more information on the Sparo Community Giving Platform, visit https://www.SparoPrize.com. The Sparo Community Giving Platform was founded in 2018 to democratize global charitable giving, as a spinoff of the Sparo Corporation’s e-commerce platform founded in 2014 by noted author and foreign policy expert turned entrepreneur, Rob Sobhani, Ph.D. Through its patented SparoPrize community giving platform and Sparo Sweepstakes, Sparo aims to make it fun and easy to donate to worthy not-for-profits. Sparo operates globally and is based in the Washington, DC Metro area.